Bermuda is experiencing epidemic proportions of chronic disease. We boast the highest rates of cancer, heart disease, Type 2 diabetes and obesity per capita in the world. In the twenty first century with numerous drugs on the market for every disease known to humankind and new drugs being manufactured and fast tracked weekly, Bermudians are sinking deeper into ill health. Prescription drugs, along with surgery and diagnostic testing, are equivalent to placing band aids on gaping wounds when addressing these chronic disease conditions. So many in our community place all faith in allopathic approaches to health and healing, but the truth is each year the numbers keep rising. Many of those who live with these preexisting conditions are beset with side effects as they tread the hamster wheel of adjustments in medications, partnered with new medications, more diagnostic testing, repeat doctor and hospital visits, and no way out of remaining on prescription medications for life. New diagnostic testing facilities and pharmacies are opening on the island every year, yet relief from these chronic disease conditions does not appear to be on the decline. When accessing the situation with a think-outside-of-the-box approach, it is evident that lifestyle changes, along with implementing proper nutrition and an exercise regime, is still the most cost effective way of preventing and reversing most chronic diseases. Unfortunately, medical students are only required to have approximately 25 hours of nutritional education during their four years of undergraduate medical school. So when you ask your physician about a more natural approach to dealing with your chronic degenerative disease condition, often times they are unable to enter into a conversation that will lead to nutritional suggestions. Explanations such as, there is no natural approach, or there are no other options available other than prescription medications is the usual response. According to data collected from the US National Library of Medicine, medical students receive on average 21 – 25 contact hours of nutritional education during undergraduate medical school. Only 30 percent of medical schools require a separate course on nutrition. In 2017, Dr. David Eisenberg, adjunct associate professor of nutrition at Harvard T.H. Chan School of Public Health, confirmed that one fifth of US medical schools are required to take a nutrition course. The truth is many of our local healthcare practitioners are living with the same chronic degenerative diseases as the patients they see on a daily basis. Little emphases is placed on the importance of diet, nutrition, lifestyle changes and exercise even for our healthcare professionals. ScienceDirect, a database of scientific and medical research, concludes numerous studies confirming the reversal and prevention in connection with nutrition and chronic degenerative diseases. The popular Mediterranean diet is associated with a lower incidence of mortality and chronic disease states such as cardiovascular disease and cancer. Bermudians must take more responsibility when it comes to improving their health. Ask what options are available outside of the hamster wheel of drugs, diagnostic testing, repeat doctor visits, and surgery. Find a physician that is willing to work with you and allow you to employ integrative approaches to health while being monitored by that physician. There are a few doctors in our local healthcare system willing to work with patients who choose an alternative approach to health. It is sad to see the increasing numbers of children living with what used to be adult chronic diseases. Bermudian children as young as twelve and fourteen years old are now being diagnosed with high blood pressure, high cholesterol, obesity and Type 2 diabetes. These statistics were unheard of 15 to 20 years ago. As a result, chronic degenerative diseases are devouring our population. It does not help that many of us live in a stressful environment with financial pressures and social and family issues, along with jobs that feel like a ball and chain around the ankle. We need to look within instead of looking to others to fix a problem only we have the solution to. Why wait until it is too late and the doctor’s annual physical reveals that you have now become one of the thousands of Bermudians living with a chronic degenerative disease. Start with small dietary changes and work your way up to a more balanced diet. There is no way our healthcare system can sustain the influx of chronic disease cases in our community on an annual basis without some type of dietary intervention. At the end of the day, we can choose to be a part of the healthcare problem or we can become the solution by making changes one step at a time toward improving our health. This is not surprising. If adults are not reading labels, why would their children? Junk in, junk out. 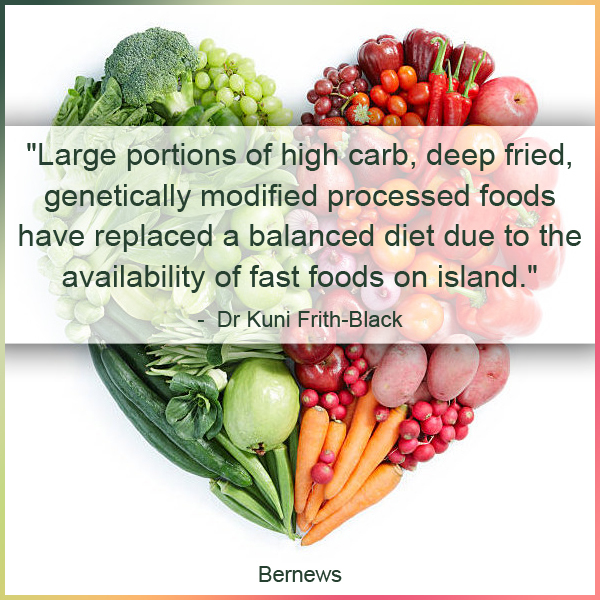 This is a really good article, by Dr Kuni Frith Bernews Aug 20 which gets right to the root causes of widespread preventable ill health in Bermuda, as well as offering tried and tested solutions. I would like to take a stab at breaking it down into easy to understand bits so that readers easily understand how these health problems arise and how they may be resolved. For most of the time humans have been on earth, diets consisted of fruit including lots of berries, vegetables including leafy greens, nuts, and non-grain fed/non-hormone injected meats ie wild meats, and fish. Such a diet is sometimes referred to as a paleo diet, the diet of humans before the advent of farming. Please note: almost nothing processed and virtually no grains at all neither whole nor processed. It stands to reason that our bodies are well adapted to such a diet and that there could be consequences to a virtual total rejection of that diet in modern times. Once farming began things started to go to that hot place in a handbasket, as the saying, somewhat modified, goes. What has become a health disaster is the lengths to which farming has gone: propelled by the profit motive. What makes this even worse is the processing and distribution of food. To maximise profits vast stretches of land are devoted to mechanised agricultural methods in order to overproduce absolute mega quantities of grain, often greatly subsidised by taxpayers money. For example, so much corn is produced that it is quite difficult to find supermarket shelves with products not containing some derivative extracted from corn. Corn happens to be a grain not easily digested by the human gut. Because so much is produced in one place the challenge is the distribution of it to markets and eventually to your kitchen, which requires transportation over large distances, requiring long periods of time, too much time for products to retain freshness. To prevent the oils in grain going rancid they are extracted. This processing removes not only oils but essential nutrients. A great example is corn flakes. The initial processing removes nearly everything except simple carbohydrates. It costs to do this leaving ‘empty calories’ or food from which essential nutrients have been stripped away. The industry got such a bad rap for this that they put some nutrients, vitamins, back, which upped the price to you even more. A balance between the main food groups, carbohydrates, protein and fats along with essential nutrients and exercise, together promote good health. The trick is finding the combination that works and committing to it for life. If you are overweight and diets are not working then it may be time to try a different approach. Success will not come overnight. This is why success in obtaining and retaining good health is often referred to as a lifestyle change. It needs to be taken in small manageable steps. It is a long term goal you seek so expect results to be slow in coming. On the positive side, you have a huge brain with astounding capabilities and one human characteristic that will help you – determination – you will need it. It has taken me nearly ten years to become comfortable with the needed lifestyle change required to drop my weight from 209 pounds to just five pounds over my target teenage weight of 165 pounds. Don’t be discouraged, I have had to learn along the way and over that time my weight has gone as high as 180 pounds. Now I am not only healthy as determined by doctors but fit and feeling as energetic as I did descending from 17.500 feet after a forty day trek in the mountains of Nepal. It need not take you quite so long to reach your goals. First it is important that incremental steps are taken. A little bit at a time. Start with the easy things, trying to cut down on the size of portions on the plate, to get used to eating a little less. The stomach will adjust, you may feel full on less. -If you must eat candy try to eat dark (70% cocoa), one or two blocks a day, never the whole bar at a sitting. -Drink wine and beer just a few times a week and with meals, cocktails seldom. -Avoid drinking sodas and juices as much as possible if not altogether. Water is good. Make gradual changes you are able to stick to so that they become permanent. Measure your weight and waist at the start and then no more than once a month. Be sure to exercise. Walking is the easiest, start with half an hour and work up to as much as 90 minutes or more. Almost any exercise is better than none but be sure that it is effective. If you really want to make a difference then inject some really vigorous/intense exercise a couple of times a week to boost your metabolism. That is what you can do. It is quite difficult to find good food on supermarket shelves, food with no added salt, sugar, some derivative of corn or soy or wheat or palm oil. So you may have to lobby your MP to introduce legislation to encourage the supply of affordable good food and at the same time discourage bad food. So added tax on white sugar, white flour for instance and for every additional cent raised subsidise good substitutes like honey and oats – zero sum game – so it makes no difference to government’s bottom line, and government makes sure that suppliers pass on to consumers both the higher tax and the subsidised benefits. It should become cheaper to eat good food and more expensive to eat bad food. Good luck Bermuda, you need this.